What are the top landmarks in Dubai? Shop ‘til you drop at one of the largest retail and entertainment centres in the world. Walk through this canal city of high-rise apartments, pleasant parklands, shopping malls and beach. Then, see it all from above in a seven-storey food court. Soar up the world’s tallest structure for a unique perspective on this breath-taking city. The hotel was impeccable every need catered for, any problem solved. I liked the room, the staff were 5 star but some of the facilities were a bit dated the excavation works at the entrance of the hotel approach made waliking anywhere dangerous. The breakfast was not worth £30 and drinks food etc very expensive. Our stay was very good and we enjoy a lot. The employers from the hotel was also very kind and friendly. Hotel well situated for Dubai mall. Takes between 5-10mins to walk. Would definitely stay again. Dubai is what happens when you design a city to be a fantasy playground for adults. Come to this futuristic landscape of metal and imagination in the UAE to be dazzled by cutting-edge attractions. You’ll be in awe of popular spots like the Dubai Fountains, the Miracle Garden, Emirates Towers, and Jumeira Beach and Park. If family-friendly adventures are what you’re seeking, you simply must visit Aquaventure Waterpark, Wild Wadi Water Park, and the Lost Chambers Aquarium. 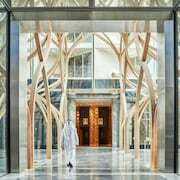 Other spots around Dubai that are sure to leave you in awe include Ski Dubai, the Jumeirah Mosque, the Dubai Museum, and the Palm Islands. Dubai is the only place where you can ride through desert dunes and frolic in an icy playground with penguins in the same day. 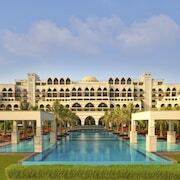 It goes without saying that there are some pretty impressive luxury hotels in Dubai. Did you know that we can help you get the guaranteed best rates around at fancy resorts and hotels? 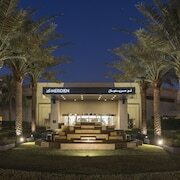 Stay right here to book your Dubai accommodation in a snap. Nobody does Dubai hotel deals like Expedia.co.nz can. 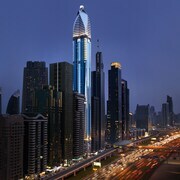 We offer the best rates around on Dubai hotels and motels of all shapes and sizes. Whether you want to stay in a futuristic suite with special features or a casual room in a cozy hotel, we’ll help you pay less for more perks. If you’re all about convenience while travelling, let us set you up with a Dubai car hire as soon as you land at the airport. Dubai International Airport (DXB) is where people from all over the planet land when they want to have the adventure of a lifetime. We can help you enjoy comfort and luxury as soon as you arrive by showing you how to reserve a room at a posh Dubai airport hotel. You’re sure to feel the sweet heat of this desert oasis as soon as you step foot off the plane. Dubai is famous for hot, humid summers that frequently experience temperatures above 41 degrees Celsius. Things get nice and comfortable at night when the temperature drops down to around 30 degrees Celsius. Luckily, the newly built hotels, malls, and entertainment arenas in Dubai are fresh and cool. Expedia.co.nz makes it easy to live the good life in Dubai without stressing over high costs. You can use our booking technology to book your holiday in this hot desert paradise without ever breaking a sweat. Simply search for deals based on your travel dates and budget to begin planning the trip of a lifetime. 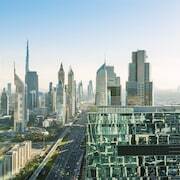 You might be surprised by just how cheap it can be to stay and play in a rich, decadent destination like Dubai when you have the right travel experts by your side. Let us help you discover savvy ways to cut costs without sacrificing an ounce of pleasure or adventure during your holiday. Make your desert desires real by booking your adventure with us today. 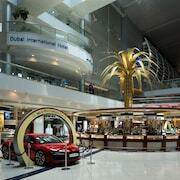 Explore Dubai with Expedia.co.nz’s Travel Guides to find the best flights, cars, holiday packages and more!